The spacecraft of the future may not be flying saucers or space-warping starships, but "interstellar sailboats" that weigh no more than a few grams. That’s the idea behind "Starshot," the proof of concept plan announced by astrophysicist Stephen Hawking and Russian billionaire Yuri Milner at One World Trade Center earlier today. The goal of the project is to reach Alpha Centauri, our solar system’s nearest neighboring star system, 4.37 light-years away. While it would take NASA's Voyager probe about 70,000 years to reach Alpha Centauri (if it were headed in that direction), Milner and Hawking propose a spacecraft that could reach the star system in 20 years moving at 20 percent the speed of light. 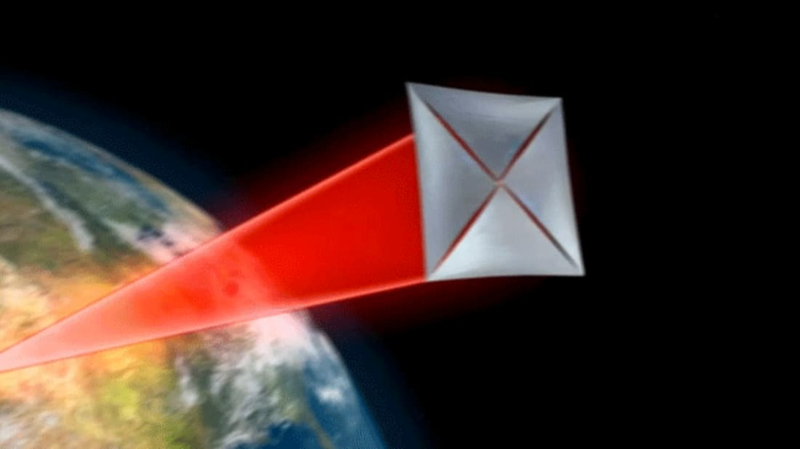 The Starshot nanocraft would swap heavy and expensive chemical fuel for lightweight sails. The "Lightsails" would stretch a few meters wide and weigh mere grams, and the equipment they’d pull would be even smaller in scale. A wafer-thin "StarChip" the size of a postage stamp would contain all the cameras, photon thrusters, power reserves, and navigation and communication gear necessary for the journey into the cosmos. To propel the nanocraft, a group of lasers on Earth would converge to deliver a single, concentrated beam of light into space, hitting the sail and pushing it forward at 100 million mph (you can see what this might look like in the animation below). Multiple probes would be released at once, and when they reached the foreign star system, they would be able to capture images of possible planets and transmit the data back home. Hawking and Milner have a history of collaborating on ambitious space exploration projects. Last year, they launched the Breakthrough Listen campaign in search of intelligent life beyond our own planet. Their latest initiative would send human technology farther into deep space than ever before. There are plenty of challenges ahead of them. Cost is a primary one. Milner is investing $100 million for the initial research and development; they estimate the entire project could run upwards of $10 billion. Nevertheless, at today's event, Hawking appeared optimistic, saying: "With light beams, light sails, and the lightest spacecraft ever built, we can launch a mission to Alpha Centauri within a generation."